CLASSIC PORSCHE 993 FOR SALE? WE BUY CLASSIC PORSCHE 993. Call Peter Kumar To Sell Your Classic Porsche 993 In Any Condition. We Buy Vintage Porsche 993 From Any Location in the US. We Are Porsche 993 Buyer : We constantly want to Buy Classic Porsche 993 in any condition. If you have a Porsche 993 for sale and want to know what your car is worth, we can guide you to find its value. Helping you sell your Porsche 993 will be our priority. 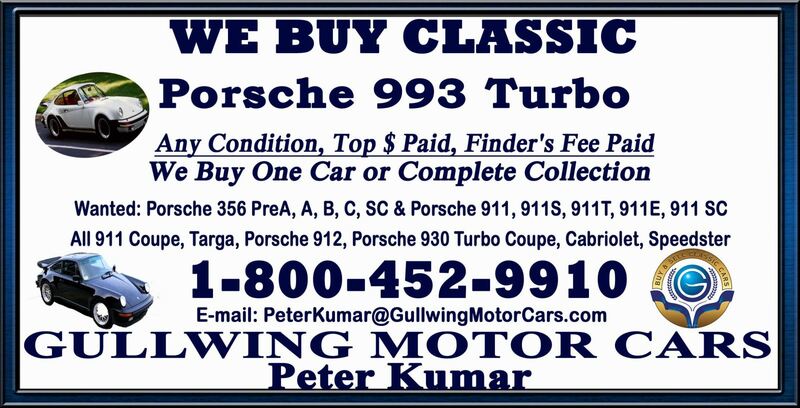 If you know anyone amongst your friends, family or in your neighborhood who own any old or classic Porsche 993 then please contact Peter Kumar. We purchase classic Porsche 993 whether it has been parked inside a garage for long time or out in a barn. If you want to either find out its value or are looking to Sell Porsche 993 then please give us a call. We make Selling Porsche 993 simple and easy. We gladly pay finders fee if you find us Porsche 993 in any condition. Our team is always chasing to buy Porsche 993 project cars, barn finds or completely restored cars. We have over 30 years of experience in the classic car industry. Our prestigious reputation is world renowned. Gullwing Motor Cars team will make the process very simple and easy for you. We buy classic cars from any location in the US, and are just a phone call away. Peter Kumar, the president of Gullwing Motor Cars will be looking forward to hearing from you; provide us a chance to do business with you! Your satisfaction is our top priority. We Buy Porsche 993 in any condition from mint condition to project cars, needing restoration, barn finds. We love classic Porsche 993. That's why we're always looking to buy your classic Porsche 993, in any condition! Whether its fully restored or a little banged up, were interested in buying! Interested in finding your cars value? Give us a call today! Do you have a classic Porsche 993 in storage? How about a fully-restored Porsche 356? Give us a call today. Not only do we offer top-dollar pricing, but well pay the finders fee, making the selling process easy and enjoyable. Do you know somebody with a Porsche that they are looking to sell? Point them in the direction of Gullwing Motors, New York's leading Porsche buyer! From the Porsche 356 to the Porsche 993 911, and everything in between, well buy!Whatever the condition of your Porsche 993, give us a call. Remember, well pay the finders fee! Choose Gullwing Motors for all of your buying and selling classic car needs! Always looking to Buy Classic Porsche 993.